Epson's new PictureMate Show snapshot printer is unlike any model we've seen, for one reason: It incorporates a 7-inch, WVGA (480-by-800-pixel), 15:9-aspect-ratio digital frame in addition to the usual printing capabilities. That cool feature comes with a high price--$300--but given that Epson already makes some of the best snapshot printers we've tested, the PictureMate Show could be hard to beat. We'll tell you for sure once we get a chance to review it. The PictureMate Show comes with 270MB of on-board memory for storing photos, as well as twelve slideshow formats that can incorporate clocks, calendars, or effects such as animation or a photo-book appearance. The included remote control lets you manage all of the digital-frame functions from afar. As a printer, the PictureMate Show offers a wealth of features. 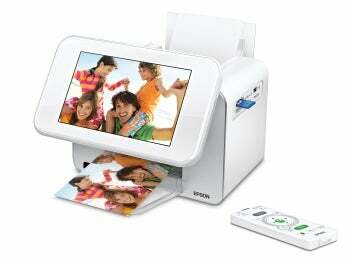 You can upload photos to the printer using one of its many media slots or its USB/PictBridge port. It can automatically correct common flaws such as red-eye, or overly dark or light images. And you can crop photos or choose from various border and layout options before you print. Though this printer sounds amazing, I still noticed one thing that it can't do: print on anything other than 4-by-6-inch photo paper. By comparison, all of HP's snapshot printers print on 5-by-7-inch paper, and the new Photosmart A646 Compact Photo Printer prints on 4-by-12-inch panoramic paper, as well. I'm actually surprised that Epson hasn't added this capability, since its snapshot printers are so good otherwise. If we have any additional gripes, we'll let you know--stay tuned for our review.